UWWA kicks off 2018 fundraising campaign, revealing a large goal. Cheese Louise brings mouth-watering creations to Tuscaloosa. GET CRAFTY Need some storage ideas? Get creative with Woodbank Lane. here in Tuscaloosa this month. 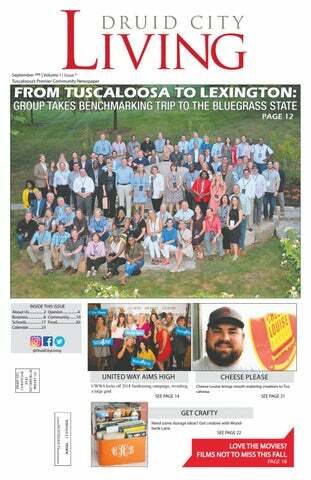 Special thanks to Shane Dorrill for a really insightful piece about how our great city is looking to other cities, like Lexington, for ways to improve and grow. And the United Way Campaign for the year is officially underway, with a lofty goal, and I’m sure they can reach it – with our help. You’ll find some great food articles this month, as well, from Amy Poore’s delish chicken to Sheena Gregg’s profile of a fab grilled cheese food truck, titled appropriately enough: Cheese Louise. Enjoy this month’s DCL, and we all thank you for your readership. RTR! What social media is best for my business? The majority of Americans use at least one social media channel. Facebook (68% of Americans) and YouTube (73%) dwarf the other social media outlets in sheer numbers and have the broadest demographic reach plus have a strong relationship with purchasing decisions. Younger users (18-24) use a variety of channels heavily, such as Snapchat (78% of young users), lnstagram (71%) and Twitter (45%), in addition to Facebook. Purchasing behavior is more closely aligned with Facebook and lnstagram than other social media outlets. Linkedln, while low in overall usage numbers compared to other outlets, is especially popular with college graduates (50%) and high income households. YouTube, while not typically thought of as social media, has many social elements and can be a strong part of a social media strategy. To reach the most people in the broadest demographic, Facebook is the best choice for most businesses today. Their ad platform is simple and it is easy to pinpoint based on location and interest. However, businesses that are very focused on younger demographics or have a client base closely aligned with another platform (Pinterest for crafting or Linkedln for recruiting or lnstagram for lifestyle brands) may choose to focus on those platforms. Note: Businesses don't necessarily have to choose. Posting to multiple channels at the same time is available in a variety offormats. www.druidcitymedia.com Caring. For Life. with the latest technology. relief. Pessimists are waiting to watch it fail. What was his response to that? “I don’t mean give everyone a jet. Give them an income floor… we don’t know what they’ll do with it. I want to try it in my city, good or bad. I am an eternal optimist. I know the folks in my city, and I believe it is going to be good.” One of my magazines had an “everlasting summer” list of things that we We took a wonderful vacation this summer to California. I’m doing everything I can to extend my everlasting summer! Photo: can all do beyond Allison Adams the summer months If you’re looking for a place to Allison Adams is a mom of four and to extend that wonmake a difference locally, there are a Realtor with Lake Homes Realty derful feeling. Most of them were for serving Lake Tuscaloosa. For comself-satisfaction, which is good (that’s lots of individuals, groups, and businesses doing great things. Not sure ments, email aadams@lakehomes. what summer is about, after all). But where to start? Giving blood is always com. beyond stomping grapes, sightseea good option. And after that, who ing, feasting on fish, and watching knows? You may come up with your the stars, there is more. We can do all these things with our kids, but we also own way to give back and make big changes. If so, be sure to share it with need to find a way to teach them to spread acts of kindness. That’s guaran- us at DCL. Blessings, teed to make waves. Try it this week, and see how great it feels. Allison Little things. Big changes. Tuscaloosa is seeing lots of them. The Land of Oz: Do You Have “CFVD”? How to Tell (and In-Home Testing) By Derek Osborn A monthly editorial piece of masterful opinionated writing (insert joke here) regarding life and times in the big town of Tuscaloosa, coupled with the musings of a guy nicknamed “Oz.” Don’t worry. CFVD is not as bad as it sounds. By the time you read this, you most likely will have taken in your first annual dose of the phenomenon that is College Football. If for some reason you haven’t, it probably means that you are immune to CFVD (College Football Viewing Disease). Should that be the case, I congratulate you… for you officially have 13 more free Saturdays throughout the year than those that suffer from the affliction. CFVD is a common ailment that typically strikes within the late summer and fall months, but it can persist through winter in extreme cases. It is especially prevalent in the Southeast. As of this writing, there is no known cure. Signs and symptoms of CFVD vary from person to person, and can include, but are not limited to: weight gain (snacks and drinks), increased cholesterol levels (snacks and drinks), inadvertent sleeping (halftime naps), sleep deprivation (West Coast games), itchy, watery eyes (prolonged visual stimulation), rash/bed sores (prolonged couch-sitting), grouchy spouse (stemming from largely ignored house chores, such as grass-cutting, trash takeout, general home maintenance, etc. ), a marked increase in chicken wing consumption, increased heart rate/ blood pressure (if your team scores, or if your team doesn’t score), and extreme emotional fluctuations (irritated/frustrated to overjoyed/ exuberant, or vice versa, during the process of one play). If these symptoms sound familiar, it is important to identify whether you, or a loved one, has been infected. Please answer the following questions honestly: • Is watching all or a portion of College Gameday part of your Saturday schedule? • Are you familiar with the term, “MACtion?” • Do you know how to spell the word “Go” in Louisiana? • Do you check the TV schedule to see who is playing College Football on Thursday and Friday nights? • Have you memorized Alabama/Auburn/ Your Favorite Team’s 2018 Schedule? • Do you know what color Boise State’s field is? • Have you ever set up two or more TV’s in one room for maximum viewing? • Can you name the four primary hosts on College Gameday? • Do you know what color Eastern Washington’s field is? • Do you commonly go to sleep watching the late-night PAC-12 game? Scoring Guide 1-3 Affirmatives: CFVD has not completely set in. There is still time to avoid altogether. Spend time with friends and family who do NOT watch football, and enjoy 13 extra Saturdays in your year. 4-6 Affirmatives: CFVD is probable. Embrace it, and go all out, or seek medical advice. Do or do not… there is no try. 7-10 Affirmatives: CFVD is full blown. Invest in Pepto-Bismol, Neosporin, chicken wing restaurants, a lawn care service, and some quality eye drops. Derek Osborn is the Executive Director of PRIDE of Tuscaloosa by trade and a writer by hobby. He lives in Tuscaloosa with his wife, Lynn, and their daughters, Savannah and Anica. Find him on Twitter @ozborn34. Our Top 3 Tips Based On Our 25 Years Of Closet Installation Experience) Are: 1. Watch out for hanger length. It is hard to keep your clothes neat, regardless of how expensive the finish on your closet system is, if your hangars are continually tangled. 2. Corners can be tricky. This is an area where it is easy to make a mistake in measuring. Make sure that anything that is going to stick out is not going to impede access to another area. Whether it is a pull out shelf, a shoe rack or hangers, make sure that there is room for it. 3. Measure, measure, measure. Measure the shelves, measure what needs to go on the shelves, measure how much room you need to move around. And then measure it again. Or you can call us. Our overall cost is typically only about 5 percent more than doing it yourself from a big box store. For example, 5% is $25 on an average job. Without the aggravation and time to learn how to do what we do expertly. News and Happenings 1 The 2018 Adopt-A-School Kickoff, presented by Smile Doctors, was held Wednesday, August 1 and featured a panel discussion moderated by Terri Brewer of WBRC Fox 6. Panelists from Mercedes-Benz U.S. International Inc., Vance Elementary School, Onin Staﬃng, and Central High School discussed some of the successes their partnerships have created for students. 4 Shelton State Community College has named Jason Moore as the College’s Dean of Workforce and Economic Development. A graduate of Shelton State, Moore brings 21 years of varied experience in manufacturing, teaching, and college leadership, most recently serving as Shelton State’s Associate Dean for Corporate Programs. Are you looking for the perfect flooring solution? At Cottage Supply Company we can help you find it. Whether itâ&#x20AC;&#x2122;s carpet, tile, pre-finished wood, or sand and finish wood, we do it all. We also have a large selection of luxury vinyl tile and plank for you to choose from. and started rowing in the same direction as everyone else. Without a consensus, positive change doesn’t happen,” he said. Page is pleased with the change in the mindset he has seen in the community just after the first two benchmarking trips. He believes city leaders from both Tuscaloosa and Northport are already putting ideas into place, and points to committees that have been formed to discuss everything from infrastructure to housing to public art as examples. He said the first pieces of public art are being installed in the coming weeks and months. Next year, the Chamber’s benchmarking trip will be to Chattanooga. According to Page, leaders plan to take a close look at how the city developed their riverfront in hopes of bringing some of those ideas back to Tuscaloosa. “We know next year’s trip will be even bigger, and I encourage anyone who is interested in positively impacting the future of our community to join us,” Page said. was touched by a UWWA agency,” Plaster said. “United Way of West Alabama has 26 partner agencies that help thousands of individuals. In fact, one out of four West Alabama residents are impacted by UWWA and their partner agencies.” About 90 cents of every dollar raised by UWWA goes directly to support organizations and initiatives for diverse causes in West Alabama. Over 100 volunteers review requests throughout the year to distribute the United Way’s funds for maximum impact. “There are so many more people who need or can benefit from their services, but who may not know about what programs are in our community to help them – that is why I am committed to raising money for the UWWA campaign,” said Plaster. From supporting wellknown programs like the YMCA, Big Brothers Big Sisters of West Alabama, and Dolly Parton’s Imagination Library, to offering a community helpline, the United Way contributes to life-changing aid every single day, Mann says. Scavenger Hunt. On September 13, go explore downtown Tuscaloosa, meet new people, and win prizes. For other ways to help, and more information, visit uwwa.org. Bryant High School Named Naval Honor School Three Years in a Row By Shane Dorrill For the third consecutive year, the Paul W. Bryant High School Marine Corps Junior Reserve Officer Training Corps (MCJROTC) program has been designated a Naval Honor School by the Marine Corps Reserve Association. “It was a great honor to be named a Naval Honor School once, but to receive the distinction three years in a row is a testament to the hard work and dedication of the students in our program,” said Maj. J.D. York, Senior Marine Instructor at Bryant High. “There are a small number of schools in the country that have an established tradition of excellence. You expect to see their names on the list every year similarly to how you expect to The Marine Corps Reserve Association has designated the Paul W. Bryant High School Marine Corps Junior Reserve Oﬃcer Training Corps (MCJROTC) program as a Naval see Alabama football in the top Honor School for the third consecutive year. Photo: Paul W. Bryant High School five every year. To be included among these schools sets a stan“It is our students that go out and program.” ing up on time or getting good grades, dard in the program that challenges the accomplish all the great things we have In order to earn the Naval Honor and there’s no in between,” York said. students to be continuously improving achieved. Master Sgt. (Dustin) Garig School distinction, the Bryant cadets “You are either ‘Full Mission Capable’ all of the time.” and myself simply provide them with displayed an extreme amount of dedica- or ‘Not Mission Capable.’” The honor means Bryant’s MJROTC guidance and set up opportunities for tion and hard work according to York. “As a Marine, it is unacceptable to program ranks in the top 20 percent of them to learn and excel,” York said. They achieved a “Full Mission Capable” ever be ‘Not Mission Capable,’ so we all programs in the country. This year, “We had an outstanding group of score on their most recent Commanding are proud that the Marine Corps has Bryant finished in the top five of all senior cadets who were fully committed General’s Inspection. found our program to be satisfactory, schools selected for Region 2, which is to the program and put forth their best “Marines define everything in terms and that our cadets have met or exceedmade up of Alabama, Georgia, Tenneseffort in everything they did. They took of mission, meaning there is an impered the requirements that are expected of see, Florida, and the Carolinas. York the initiative to introduce new events ative to make sure everything you do them.” said the high ranking should be credited and activities that really helped grow the is accomplished, whether it’s showto last year’s cadets. The summer movie season is behind us, the weather will soon cool off (we can hope), and, fortunately for film lovers, some great movies are on the way this fall. There’s a lot coming out between now and December. Here are some of the highlights, so you can plan your trips to the theater accordingly. Here is no less than the fourth iteration of this showbiz love story that has previously starred Janet Gaynor, Judy Garland, and Barbra Streisand. This one stars Lady Gaga (aka Stefani Germanotta) as Ally, an up and coming artist who is discovered and coached by a seasoned musician named Jackson (Bradley Cooper, who also directs). Once she’s on the way to stardom, their paths diverge. Ally rockets to fame, and Jackson’s career hits the skids due to his alcoholism. You can probably surmise by the title that this has something to do with Queen. And you’d be correct. Directed by X-Men’s Bryan Singer and starring Rami Malek, this is the full-blooded biography of the band, focusing on the life and times of Freddie Mercury – a man who defied conventions, stereotypes, and even preconceptions about what a musician is and should be. Bohemian Rhapsody follows the rise and fall of the band, leading up to their legendary appearance at Live Aid in 1985. Unofficially known as Wreck It Ralph 2, this Disney sequel takes the reformed video game villain and his sidekick, Vanellope von Schweetz, into the landscape of the internet in order to find a missing part to save Vanellope’s video game. Officially, this is the sequel to 2015’s Creed. Unofficially, it’s the seventh sequel to Rocky. Either way, the story figures that Adonis Creed (Apollo’s son) has been trained by Rocky and become the heavyweight champion – only to be challenged by Viktor Drago, son of Rocky’s former competitor, Ivan Drago. He’s also the man who killed Adonis’ father in the ring 30 years ago. The world’s favorite “Practically Perfect” nanny returns (played by Emily Blunt) in this long-awaited sequel to Walt Disney’s 1964 classic. Time has passed, Jane and Michael Banks (Ben Whitshaw and Emily Mortimer) have grown up, and the Banks family has grown apart. Mary, after a personal loss, returns to their lives to help them find their togetherness again. baby’s birth.” Each new mom receives a printed certificate of her newborn’s footprint during her stay. When she gets home from the hospital, she can visit a special website to download a digital copy of her baby’s footprint, and enhance it using software that offers different colors, fonts, and borders. I support Easter Seals of West Alabama. Easter Seals helps people reach their full potential. That is important to me - and our community. I also teach Zumba fitness classes at an affordable rate, giving away two scholarships per month, to help keep residents in our community healthy! HONEY GARLIC CHICKEN • 3 boneless, skinless chicken breasts • 4 garlic cloves, minced • 1/3 cup honey • 1/2 cup soy sauce • 1/2 cup ketchup • 1/2 teaspoon dried oregano • 1 tablespoon dried parsley • 1/2 tablespoon toasted sesame seeds Combine garlic, honey, ketchup, soy sauce, oregano, and parsley in a small mixing bowl. Place the chicken in the bottom of your slow cooker. Pour the sauce over the chicken. Cook on low for 7-8 hours, or on high for 4-5 hours. Shred chicken in the slow cooker, and stir to combine with the sauce. Serve over cooked rice noodles topped with toasted sesame seeds. what? They’re no bake! Yep, I’ve hooked y’all up with some tasty recipes that don’t require your oven. You’re welcome. Have a great month, and bon appétit! Amy Poore is a Tuscaloosa mom, wife, and foodie. To see more of Amy’s delicious recipes, visit her blog, Poore Amy, at pooreamy.com. Photos by Amy Poore. PEANUT BUTTER STACKS • 1 cup light Karo syrup • 1 cup sugar • 1 cup peanut butter • 6 cups corn flakes In a small saucepan over low/medium heat, combine the syrup and sugar until the sugar dissolves. It will not take long; do not overcook. Remove from heat, and stir in the peanut butter until smooth. In a large mixing bowl, gently combine the cereal and peanut butter mixture. Place scoops of the final mixture on wax paper, let harden, and store in an airtight container. yourself this fall? Look for the truck on Paul W. Bryant Drive at Trinity United Methodist Church every Alabama home football game this season. For more information about Cheese Louise, including a full menu and locations, visit cheeselouise.co. “A place for everything, and everything in its place.” Nice idea in theory, right? Sometimes it’s hard to find the perfect spot for the things we use daily. And if you’re like me, you may not have a ton of cabinet and closet space, making storage at times a challenge. But that’s okay; it doesn’t all have to be tucked away and out of sight. With the right decorative container – box, bowl, basket, or tray – everything can have a place. Hi there! I’m Kathryn, and here are a few creative storage ideas I’ve used in my home that might work for you as well. One When my daughter finished her ninth-grade year of high school, we decided to update her room. One of the colors we chose was terra cotta, orange with a touch of pink. Although we really liked the color, the choice made it hard to find matching accessories. I was always on the lookout for anything in the right shade that she could use. On one of my many trips to Target, I ran across a utensil caddy. It matched perfectly, but what could she possibly do with a knife, spoon, and fork holder? I had no idea, but I bought it anyway, hoping we could come up with something. When I carried it home and took it to her room, I was met by a pile of Seventeen magazines and stacks of books on the floor. Mystery solved! It became a “literary device.” The rolled magazines slid perfectly into the three sections designed for silverware, and the books fit just right in the front slot designed to hold napkins. Two Want to add a fresh scent to your bathroom and free up some cabinet space? I usually buy our soap in bulk at Sam’s or Target to save a little money. But instead of storing it in our small linen closet and taking up a shelf, I open the boxes and put them in a glass bowl. It’s a fresh smelling idea (literally! ), and it adds a pretty, decorative look to the room. If you decide to give this storage idea a try, make sure the bowl you chose has an opening large enough for your hand. Three I bought a pretty soap dish that ended up being too big for the sink area where I intended to use it. No problem! I washed off the goo and repurposed it. The cute soap dish became the new locale to plop some of my jewelry at the end of the day. I’ve never really been one to use a traditional jewelry box. And because I tend to wear the same accessories over and over, I like my every day, go-to jewelry to be easy to grab when I’m in the midst of the morning rush. The soap dish now serves as a jewelry keep for what I frequently wear. I love the design of the dish, and it looks perfect in the tray on the bathroom counter. Four Functional baskets are probably the easiest of storage ideas. I have them in just about every room of my house holding magazines, books, remote controls, even junk. One way I use them in my bedroom is to store seasonal items like gloves, toboggans, and scarves. I have my small winter items packed away in two large baskets that I found at Twice as Nice downtown. I slide them under the bench at the foot of my bed and slide them right back out when the weather cools off. T J Maxx and World Market are both great sources for attractive and large baskets to use for storage. Hopefully, I’ve given you a storage idea or two you can use in your own home. September Calendar of Events Camping World Kickoﬀ Game – Alabama vs. Louisville: Sept. 1, 7 p.m. Camping World Stadium, Orlando. The Tide and Cardinals square off in this premier college football matchup, which will be broadcast on ABC. For more information, visit rolltide.com or campingworldstadium.com. Bama Art House Films Presents “The Rider”: Sept. 4, 7:30 p.m. Tickets: $8 general, $7 for students and seniors, $6 for Arts Council members. Box office opens at 6:30 p.m. For more information, visit bamatheatre. org. tourney is a 25-team, four-man golf scramble. Trophies will be awarded, and the event also includes door prizes, a raffle, and more. For more information, call Mark Hughes (205) 556-1000. 2018 Tuscaloosa County Civic Hall of Fame Induction Ceremony: Sept. 20, 2-3:30 p.m. Citizens who have contributed to the betterment of the Tuscaloosa County community will be inducted. For more information, email carolyn@tuscaloosachamber.com.